The Fitzpatrick Stationary Living Room Group by Best Home Furnishings at Best Home Furnishings in the St. Louis, Chesterfield, St. Charles, MO & Waterloo, Belleville, Edwardsville, IL area. Product availability may vary. Contact us for the most current availability on this product. Leg or Skirt Exposed wood bun turned feet. Arm Type Elegant rolled arms add traditional appeal. Wood & Finish Available in Antique Black or Distressed Pecan finishes. Furnish your living room with the traditional style and classic appeal of the Fitzpatrick collection. This group features a sofa, loveseat, club chair (not shown) and ottoman (not shown). 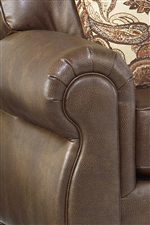 Plump seat and back cushions create an inviting seat, where you can relax and spend time reading or watching television. Elegant bun wood turned feet and rolled arms complete the traditional design. With over 700 different fabrics to choose from, as well as a choice between Antique Black or Distressed Pecan wood finishes, enhance your home with a design that suits your style and taste. Create inviting, cozy seating with the classic look of the Fitzpatrick collection. 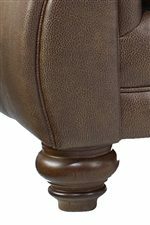 The Fitzpatrick collection is a great option if you are looking for Traditional furniture in the St. Louis, Chesterfield, St. Charles, MO & Waterloo, Belleville, Edwardsville, IL area. Browse other items in the Fitzpatrick collection from Best Home Furnishings in the St. Louis, Chesterfield, St. Charles, MO & Waterloo, Belleville, Edwardsville, IL area.